Chinese Premier Li Keqiang on Friday proposed a series of measures to promote cooperation between China and Central and Eastern European Countries (CEECs). Li made the proposal when addressing the eighth China-CEEC leaders' meeting in the Croatian city of Dubrovnik. Li noted that Chinese President Xi Jinping recently made successful visits to three European countries, injecting new impetus into deepening development of the China-European Union (EU) comprehensive strategic partnership. As part of the China-EU relations, the China-CEEC cooperation mechanism has been conducive to promoting European integration process and advancing the China-EU ties, the premier said. On future development of the China-CEEC cooperation, Li called for jointly defending multilateral trade system, upholding such basic principle as openness, transparency, inclusiveness and non-discrimination, and sticking to the direction of trade liberalization. On expanding trade volume, Li said China is willing to import more high-quality agricultural products from the CEECs and make it easier for such products to be exported to China. Calling for joint efforts to build the Belt and Road, the premier said China is willing to enhance the alignment between its development strategies and those of the CEECs, stick to the principles of extensive consultation, joint contribution and shared benefits, and better draw on complementary advantages, so as to achieve win-win results and common prosperity. 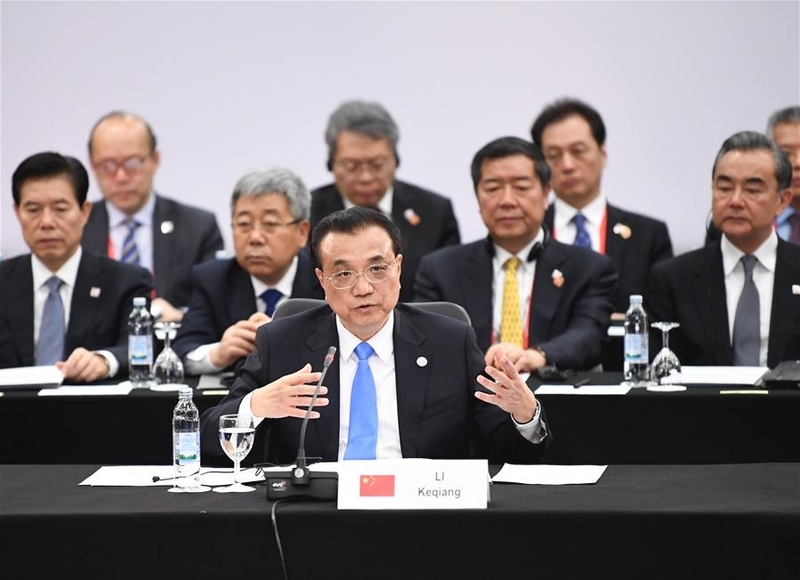 Urging greater efforts to boost innovation cooperation, Li said China is willing to work with the 16 countries to conduct joint research, expand scientific and technological exchanges, and cultivate growth points through innovation cooperation. The premier also stressed the importance of jointly safeguarding a fair, just and non-discriminatory market environment. Li also called for continued efforts to promote cooperation in the fields of small and medium-sized enterprises (SMEs) and industrial park building, adding that China and the CEECs have held cross-border matching events of SMEs, and launched a website for the SMEs coordination mechanism. On their part, CEEC leaders said, after the launch of the cooperation mechanism, the CEECs and China have seen their pragmatic cooperation bearing remarkable fruits, political mutual trust continuously strengthened, trade and investment rapidly growing, and cooperation in fields including education, tourism and culture continuously deepened. The cooperation mechanism has continuously shown new vigor and vitality and become an important cross-region cooperation platform featuring openness, inclusiveness, mutual benefits and win-win results, they said. The mechanism has not only boosted economic growth of each country and enhanced the wellbeing of their people, but also effectively promoted the overall EU-China relations, they said. All sides are ready to take this meeting as an opportunity to fully support the implementation of CEEC-China cooperation projects, further promote connectivity and infrastructure building, actively participate in the joint building of the Belt and Road, continuously expand trade volume, jointly safeguard multilateralism and free trade, increase personnel exchanges, and expand exchanges and cooperation at local levels and in fields including tourism, health, sports, and think tanks, the CEEC leaders said. After the meeting, China and the CEECs jointly published The Dubrovnik Guidelines for Cooperation between China and Central and Eastern European Countries, and the leaders witnessed the signing of more than 10 cooperation agreements. Later on Friday, Li and Croatian Prime Minister Andrej Plenkovic met the press after the leaders' meeting. Both leaders spoke highly of the new progress made in the China-CEEC cooperation and called the meeting efficient, pragmatic, fruitful and successful. Speaking to reporters, Li said, faced with the current complicated international situations, all sides should work to safeguard multilateralism and free trade.